JERUSALEM (CNS) — Israeli restrictions on reaching the Church of the Holy Sepulcher for Holy Week and Easter are part of the current Israeli government’s policy of making Jerusalem an exclusively Jewish city, said Yusef Daher, secretary-general of the Jerusalem Interchurch Center. Describing the network of Israeli police barriers that disrupt the flow and number of people able to reach the church for Good Friday services and the Orthodox Holy Fire ceremony at the Easter Vigil, Daher acknowledged that although the single entrance and exit to the church cause a potential hazard in case of a fire, there had been no problem in more than a century. “This (restrictions) did not happen 10 years ago,” he said. The Holy Fire ceremony involves the sharing of fire which, according to tradition, is brought forth miraculously from the tomb of Jesus by the Greek Orthodox and Armenian patriarchs. The first flames are passed from person to person by torches to bundles of candles. Eventually fire from the ceremony is sent to the various parishes of the Holy Land. Police say the single exit into a plaza makes the ceremony a high risk for visitors if a fire breaks out. In 1808, a fire severely damaged the dome of the Rotunda, and dozens of pilgrims were trampled to death, while in the mid-1800s a fire during the Holy Fire Ceremony reportedly also killed hundreds of pilgrims. Palestinian Christians living in the West Bank and Gaza also need special permits in order to attend Holy Week and Easter ceremonies. Israel grants the permits at the last minute, and then often does not grant enough for everyone in the family to travel. 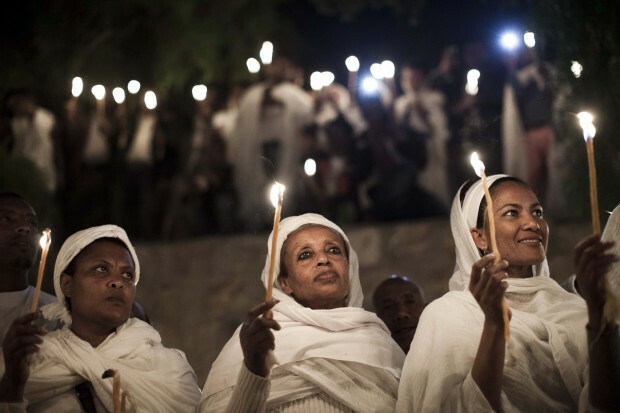 At a March 17 media briefing in Jerusalem’s Old City, Father Jamal Khader, rector of the Latin Patriarchate Seminary in Beit Jalla, West Bank, compared the restrictions to the celebration of Holy Week, which reminds Christians that Easter is coming. “It (reminds us) that this can’t go on forever, there is an end; like with the Gospel there is a resurrection of light and of happiness,” he said. The Status Quo, the 1852 agreement that preserved the division of ownership and responsibilities of various Christian holy sites, governs the Church of the Holy Sepulcher, which is shared by Catholics, Armenians and Greek, Ethiopian, Syriac and Coptic Orthodox. While the need for more exits has been acknowledged, because of the desire to maintain the Status Quo, church officials have been unable to reach an agreement on how do so. Israel has said it will refrain from taking unilateral action in order to avoid provoking church protests. There are about 8,000 Christians living in Jerusalem, he said, and 50,000 Christians in the West Bank, with fewer than 2,000 in Gaza. Over the past two years the Jewish Passover and Easter holiday have coincided and while the Jews entering the Old City have had complete freedom of movement, the movement of Christians celebrating Good Friday and the Orthodox Holy Fire ceremony have been restricted by the barriers, Daher said. Meanwhile, he said, as Palm Sunday approaches, West Bank and Gaza Palestinians had not yet received their permits, which made it difficult for West Bank parishes to plan for the transportation to Jerusalem in order to participate in the traditional procession into Jerusalem from the Mount of Olives, following the path Jesus is thought to have taken, said Khader. He said he hoped permits would still be issued.